Some more German-originated steampunk via my trusty German readers. 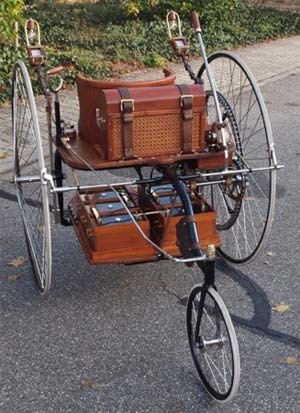 This one is the 1880 German Starley electro-Tricycle rebuilt in replica form by the Museum Autovision, a museum for cars, motorcycles, bicycles (most of which were built by NSU Motorenwerke AG) and alternative propulsion in Altlußheim, a small town in Baden-Württemberg, Germany. « It’s a DC Nation, says the Cartoon Network.